White Pelicans is the latest addition to our personal art collection. This is another amazing art work by Nelson Castillo – Father of Philippine Miniature Paintings. This art work of Nelson Castillo departed from his original style on painting on canvas with very small canvas sizes. These series are unique. 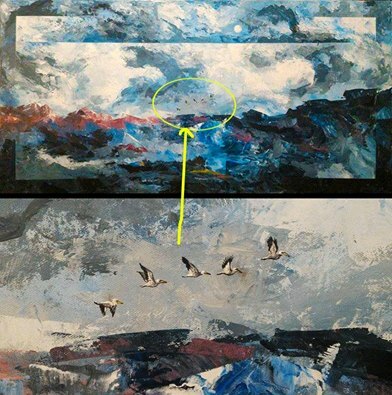 The canvas are large, 24 inches x 48 inches, depicting an abstraction of landscapes with cloudy skies on top of the mountain range with the sun on top. Looking closer in the art work, you will be amazed with the White Pelicans flying over the mountains hiding in plain sight. It is a surprised to the viewer that the White Pelicans are so detailed and you will wonder how did the artist, Nelson Castillo, managed to paint with this amount of detail. This is truly a very good conversational piece. This art work is very special for me. It was months ago when I first took a glimpse on this art work. It was when we visited the house of the artist, Nelson Castillo, when we acquired one of his miniature paintings. At that time, this art work was still a work in progress. The White Pelicans are not yet there in the painting. But with the landscape abstraction alone is a already a masterpiece. I told Sir Nelson, that when he finish this art work, let me be the first one to see it and I already reserved the painting. When the art works was completed, many art collectors have seen it and are very interested. Nelson Castillo has already reserved it for us. The art work has also been feature in several television shows. Recently, it was featured in a Philippine television magazine show “Matanglawin” last December 6, 2015. Below is the You Tube video. What makes this art work even more special is that it was my wife’s Christmas Gift for me. It was a surprised since I wanted the art work really bad that I want to go the artist studio on the day I arrived in Manila. My wife, Stephanie Yvette, refused since she already had the art work gift wrapped in our house. Truly it was an amazing gift. My wife is very supportive in my passion for arts. That is one beautiful painting. I’ll buy one when i get a bit richer.